Two pilot were operating the airplane in landing phase. 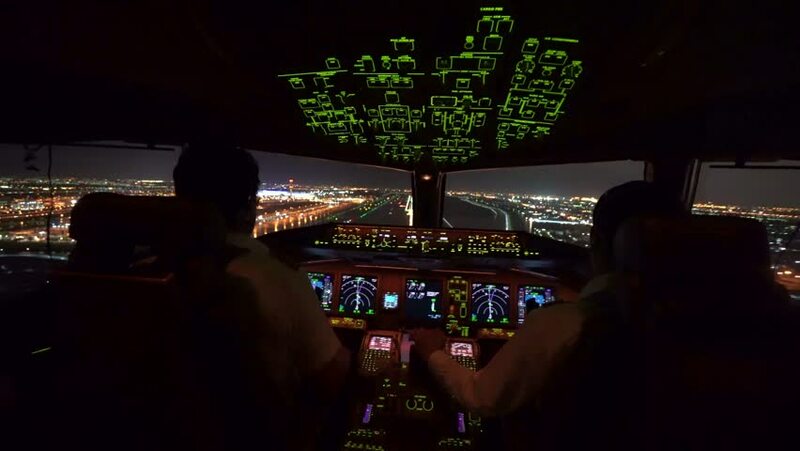 Airplane was touching down on the runway in airport at night, able to see beautiful view of cityscape and lights of runway from inside cockpit. sd00:13SEOUL - FEBRUARY 27, 2003: Night time b-roll of Jung-gu section of Seoul; Tilted MS of modern buildings with illuminated neon signs (in Korean) on them, tops of passing vehicles seen in foreground. hd00:20Bangkok, Thailand - September 25, 2015 : The traffic jam on S-shaped expressway in the foreground at night time. 4k00:43Buenos Aires, Argentina - 11/19/2017 Obelisco de Buenos Aires (Obelisk of Buenos Aires) at twilight. 4k00:17HONG KONG, CHINA - CIRCA NOVEMBER, 2015: Night view of skyline in Central District from Sevva skybar.